There are many reasons why millions of people visit Jockey's Ridge State Park. Some come to see the tallest sand dune on the Atlantic coast; others come for the spectacular sunsets. At Jockey's Ridge State Park you can experience the world of the desert. Shifting sands, high winds, extreme temperatures and a lack of water make the park resemble barren environments such as the Sahara Desert. You also can explore the wonders of an estuarine environment. The tidal waters of the Roanoke Sound, the western boundary of the park, is a rich habitat for a variety of plant and animal life, making these waters the source of much of the sea's bounty. Whatever the reason for a visit to Jockey's Ridge, a trip to this unique park will give you even more reasons to come back again and again. Jockey's Ridge is the tallest natural sand dune system in the Eastern United States. Its height varies from 80 to 100 feet, depending on weather conditions. Shifting maritime winds blow billions of grains of sand in different directions, constantly changing both the shape and size of the dune. Why doesn't the sand blow away? In the winter, the winds usually blow out of the northeast and in the summer out of the southwest; therefore, the sand is constantly blown back and forth. Also, the dunes' tiny sand particles hold moisture throughout the year. The sun dries the top layer of sand. But, just below this layer, the sand stays wet. The high winds from northeasters blow the top, dry layer off, but the wet layer below stays put. Jockey's Ridge is an example of a medano?a huge hill of shifting sand that lacks vegetation. There are several prominent sand dunes in the area. Of them all, Jockey's Ridge is the most spectacular. Geologists believe that Jockey's Ridge was formed when strong water currents from hurricanes and storms washed sand from large offshore shoals onto the beach. Throughout many years, the wind picked up this sand and blew it inland. These tiny grains of sand evolved into a system of dunes that now stretches for many miles along the coastline. Long before the first European settlers, the Algonquian Indians inhabited the Outer Banks. Following its sighting by Spanish and French explorers, the ridge became an important landmark for mariners. In the early 1800s, this remote coastal area began to develop as a summer resort. Development was slowed during the Civil War, but with the construction of a series of bridges in the 20th Century, the problem of access to the barrier islands was solved. Development picked up at a rapid pace. Today, the Outer Banks is one of the most popular recreation areas on the eastern seaboard. On a summer morning in 1973, a couple of children were playing on the dunes. When they saw a bulldozer flattening out part of Jockey's Ridge, they went running home to tell their mother. Carolista Baum went to investigate and found that an earth-moving machine was preparing a residential development site at the base of Jockey's Ridge. For years, local groups had talked of protecting the large dune from encroaching development, but no substantial steps had been taken. This destruction, however, forced Carolista into action. She planted herself in the path of the bulldozer, forcing the operator to shut the equipment down. From that point on, the effort to "save our sand dune" took on new determination. The People to Preserve Jockey's Ridge was organized. Appeals, backed by a petition, were made to local and state governments. The state's Division of Parks and Recreation was asked to study the feasibility of making Jockey's Ridge a state park. In 1973, the Division of Parks and Recreation issued a report in favor of the park, and a year later the dune was declared a National Natural Landmark. 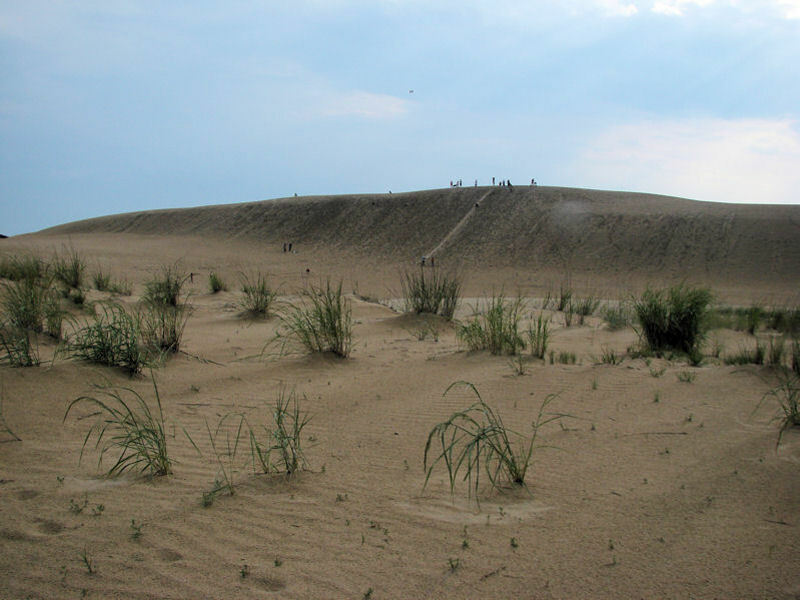 In 1975, the General Assembly appropriated funds to create Jockey's Ridge State Park. With this money and matching federal funds, the state bought 152 acres. An additional purchase from the Nature Conservancy brought the size of the park to 266.8 acres. Today, the park encompasses 420 acres. A hike to the top of the ridge can work up an appetite! The picnic area adjacent to the parking lot offers a break from the relentless wind, sun and sand. 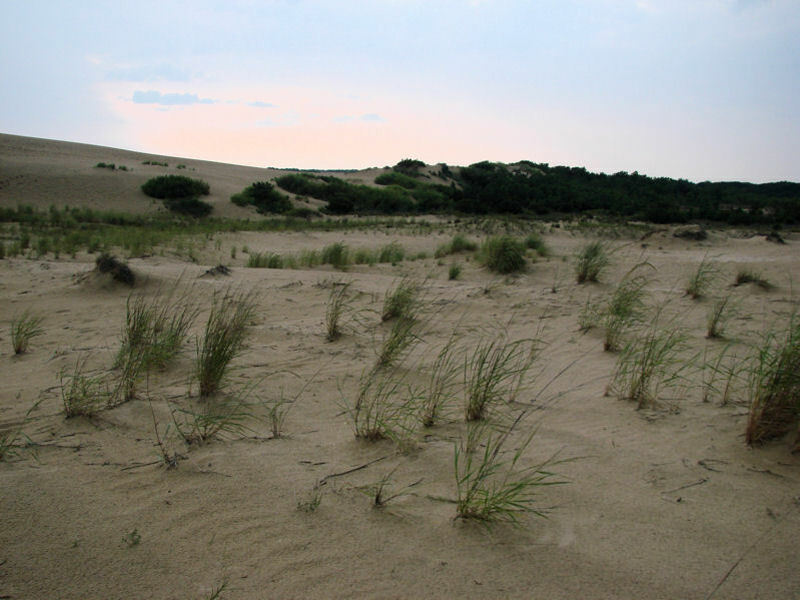 Eight picnic shelters are spaced among small dunes with low-growing vegetation. Each shelter has two tables and a grill. Drinking water and restrooms are located nearby. Use of the shelters is free unless reservations are requested. Shoes are a must to protect tender feet from hot sand and sandspurs?sand temperatures may be as much as 30 degrees higher than air temperatures. Be aware of the hang-gliding landing and launching zones; refer to the park map for the location of these areas. The ridge area closes 15 minutes before the park closes. Soundside Natural Trail: This self-guided nature trail is approximately one mile long and will take about one hour to hike at a leisurely pace. This little explored section of the park contains several different coastal environments, including a wetland area, grassy dunes and maritime thickets. Interpretive panels along the trail provide information on the many plants and animals which call this area home. Enjoy your hike and please observe the sound-side parking lot hours. Tracks in the Sand: The nature of shifting sand prevents the construction of traditional trails in the park. Tracks in the Sand is a 1.5-mile, self-guiding trail composed of 14 stations. Walked at a leisurely pace, the hike takes approximately 1.5 hours. The trail begins at the parking lot and leads through the many environments in the park. On the trail, you will see many tracks, ranging from foxes and deer to insects and birds. Brochures for the trail can be picked up at the trailhead or in the visitor's center. If you prefer a shorter trip, a 360-foot boardwalk is located near the beginning of the Tracks in the Sand trail. Interpretive displays along the route offer information about the plants and animals found in the area. A deck with a bench is the perfect place to snap a photo or sit down and enjoy nature. 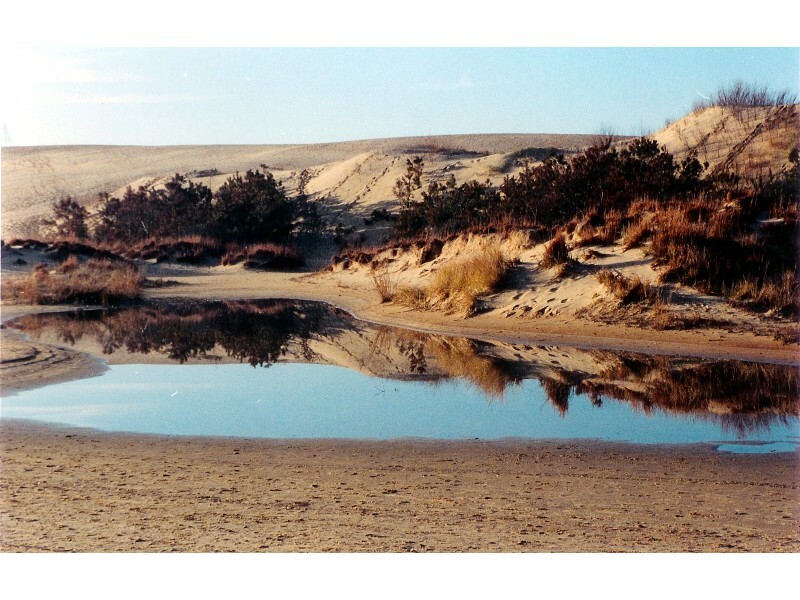 The town of Nags Head and Jockey's Ridge State Park operate an estuarine access at the base of the dune along Roanoke Sound. Facilities include two dune crossovers and informational panels about this special environment. Rangers hold regularly scheduled educational and interpretive programs about Jockey's Ridge State Park. To arrange a special exploration of Jockey's Ridge State Park for your group or class, contact the park office. Educational materials about Jockey's Ridge State Park have been developed for grades 4-6 and are correlated to North Carolina's competency-based curriculum in science, social studies, mathematics and English/language arts. The Jockey's Ridge program introduces students to the environment of a sand dune and the plants and animals that live on and around it. Major concepts covered include adaptations, animal signs and natural area preservation. Accompanying the program is a teacher's booklet and workshop, free of charge to educators. Exhibit hallLearn more about the natural, cultural and historical history of Jockey's Ridge State Park and the Outer Banks at the park's exhibit hall. Find out what dunes are made of, how they are created and how they are shaped. 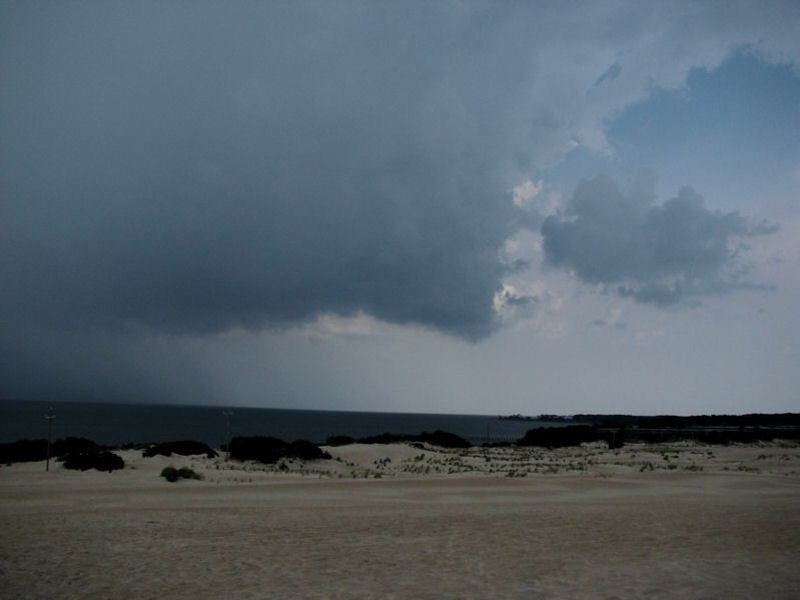 Research the history of storms and their influences on park dunes and on the Outer Banks. Learn about the plants and animals of Jockey's Ridge and about their role in the park now and how they were used in earlier days. Find out more about the various activities available on the dune. Ever wonder where the names "Kill Devil Hills" and "Nags Head" came from? Visit the exhibit hall to find out more about these and other legends, including Blackbeard's treasure. * A diorama that depicts what happens at night when the park is closed and the wildlife comes out to takes over the dune. * A computer program that allows visitors to see how the rising sea level created the Outer Banks and its dunes. * A computer program that allows visitors to research the weather at Jockey's Ridge. * Several matching games that allow visitors to match tracks to the animals that created them, dune names to their locations across the country, dune shapes to the shape's name, and leaf shapes to the corresponding plants. * A display of fulgurites, the glass tubes formed when lightening strikes a dune. Fly the same skies as some of the world's most famous pilots. Years ago, Orville and Wilbur Wright took advantage of the Outer Banks' tall dunes and prevailing winds to explore the world of aviation. Today, colorful kites, model planes and hang gliders are evidence that flying is still popular on Jockey's Ridge. Year-round winds, often blowing up to 10-15 miles per hour, make Jockey's Ridge ideal for these sports. Hang gliding is regulated by park staff for the safety of participants and other visitors. 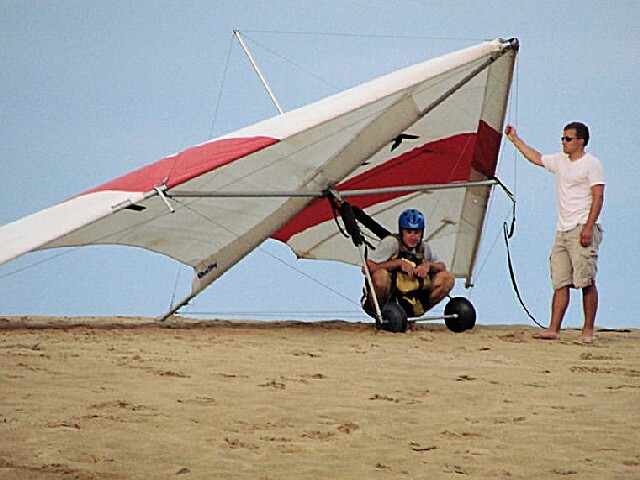 Only persons with a USHGA Hang 1 or other agency-approved rating card may hang glide on Jockey's Ridge. All hang gliders must register with the park office. Hang-gliding activity stops one hour before the park closes. Visitors may take hang gliding lessons; register at the private hang-gliding concession located near the park visitor's center. Work on your tan in the sunning area of the estuarine access at the base of the dune along Roanoke Sound or let the wind be your guide as you enjoy sailboarding. There's also a designated site for sandboarding, which is allowed October 1 through March 31. Participants must obtain a permit from the park office. 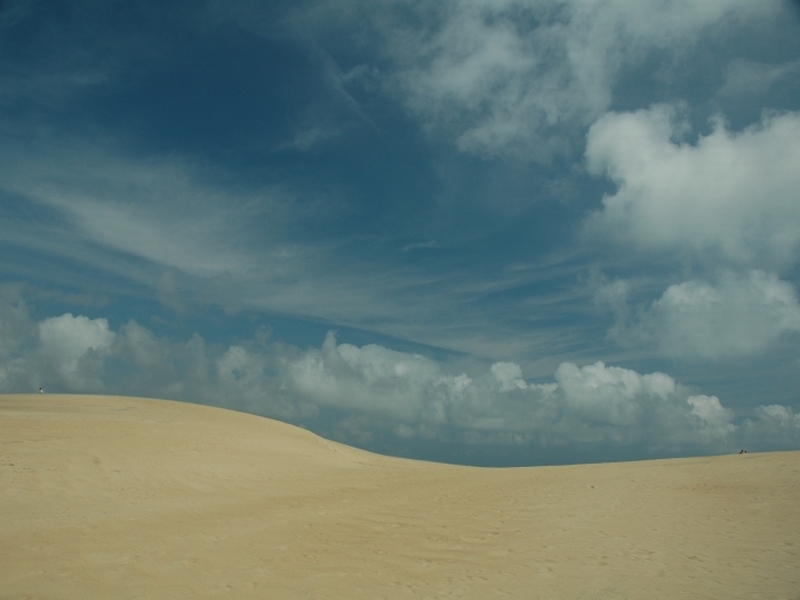 Jockey's Ridge State Park is located in Dare County on the Outer Banks. The entrance to the park, Carolista Drive, is in the town of Nags Head at milepost 12 on the Highway 158 Bypass (South Croatan Highway). From I-95, exit onto US 64 east, which merges with US 264 east before Roanoke Island. Continue on US 64/US 264 to Bodie Island and turn north on US 158. The entrance to the park will be on the left after the town of Nags Head.